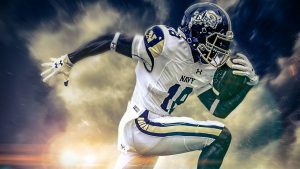 The greatest rivalry game of them all takes center stage this Saturday, The United States Military Academy Cadets take on the Midshipmen of the US Naval Academy. This is by far the biggest game of the year. No, it doesn’t have the implications of, say, the SEC Championship game, where Alabama and Georgia were battling it out for a slot in the CFP. Not this year, it doesn’t, but this game carries more history, more tradition and emotion for more people in our nation than any other. Men and women stationed through the world, defending our nation, are represented upon Lincoln Field. Today, Navy is the enemy. Tomorrow, she’s our comrade in arms. Army enters on a seven game winning streak. They have taken on some serious competition, like, earlier in the year they faced Oklahoma, who, I might point out, made it to the College Football Playoffs where they will face Alabama, so we’re not talking about a push over schedule here. The Black Knights gave the Sooners all they could handle on their home field in Norman, Oklahoma. 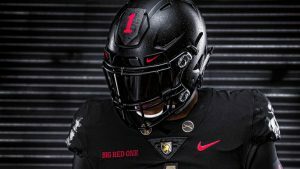 The Black Knights of the Hudson lost that game, but it went into overtime before Army succumbed. In their last game, the Cadets hosted Colgate, who were undefeated before they were manhandled by the Cadets. The Army team struggled a bit when they faced another triple option attack, against Air Force, but the Big Rabble prevailed. If you’re looking for a passing game, this is not a team for you to follow. Army runs the ball more than any other team in the nation, and they are extremely good at it. Against the Middies, there is no reason to expect anything different. This is nothing new in Army’s arsenal, their improvement this year has been on defense. For this meeting, Army will be wearing uniforms honoring the 1st Infantry Division, the Big Red One. This Division played an integral part in World War I, and this year is the 100th anniversary of the end of the War to End All Wars. Everyone knows I do not hide my bias (Roll Tide), but I do my best to be honest. I was raised by a graduate of the United States Military Academy at West Point, so when this game comes around, there is no question who the entire family will be pulling for. Any deviation is not tolerated. We will all be wearing Black, Gold and Grey that day and our hearts will be with Army! Oddsmakers are favoring the Black Knights this year, but this is the Navy game! THE Rivalry game, where anything can, and generally does, happen. The ARMY is honoring the 1st Infantry Division, and there is nothing the determined foot soldier cannot accomplish. Just ask the Babylonians about their river a couple of years ago! Infantry! Sons of Mars and Thunder, march on to victory. Go Army! Beat Navy!